Summary via Publisher: When Edy Phelps falls hard for her best friend, she knows nothing can come from it. Forget actual chemistry, or the fact that she cherishes his mother more than her own; centuries of tradition say that Hassan will grow up, marry the girl his parents pick, and forget his best friend: the dancer with the bursting smile. Except he can’t. In a world erupting with possibilities for the boy with a body of steel and dreams of the NFL, everything seems promised while nothing at all is; when he’s denied the girl he wants most. Two hearts. Two families devoted through generations of friendship. Could Edy and Hassan really risk all that? And yet… how could they not? 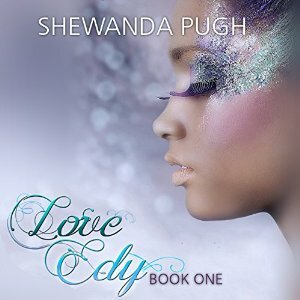 Review: For readers seeking contemporary romance and, in particular, romance that stars a black teen, Love Edy would be the book to grab. Edy is a young girl coming of age and navigating her first significant plunge into love. Edy isn’t sure she wants to risk messing up their friendship, but she definitely finds Hassan attractive and is finding it more and more difficult to hide that. The trouble is that she has fallen for the one boy she can’t have. His parents love Edy like their own, but they have other plans for their son. Sometimes this young love leads to what I saw as over-the-top drama. That may just be my perception at this stage in my life. I likely would have loved it when I was in middle school and even the first few years of high school. I appreciated that Edy is not a model of perfection. She is certainly beautiful in appearance, but she can be pretentious and downright rude – especially to other girls. She has trouble seeing beyond her world. It’s a world that includes most of the football team treating her like a princess. This is the first book in a series and I hope that in the other books, readers may see Edy continue to mature. I’ll warn you – the book ends abruptly and that is probably even more jarring when listening. When holding a book, a reader can see that they are on the final page. With audio, it’s not nearly as obvious. I was shocked when it ended in the middle of a particularly tense scene, but then remembered it was a series so it became a little more forgivable. Audiobooks are more than just the text though. The narrator can have a huge impact on the listening experience. Natalie Neckyfarow read smoothly with clarity and kept a comfortable pace. The characters were easy to keep straight, but she didn’t overact them either. Recommendation: For young romance fans, this is a book to be watching for. Get it soon. Giveaway: One easy way to get it soon is to enter the giveaway below. One lucky US/UK winner will receive a free audiobook via Audible.